On Sunday Olga and I went for a walk in the Lakes. As Olga doesn't like climbing my Wainwright activation possibilities were limited so I decided to head for Rannerdale Knotts, LDW-209, the fifth from lowest Wainwright. Despite its low height, Rannerdale Knotts looks quite forbidding. The most direct path is very steep. However the summit is also accessible by an easy walk up the valley named Rannerdale which brings you on to a ridge that leads directly to it. 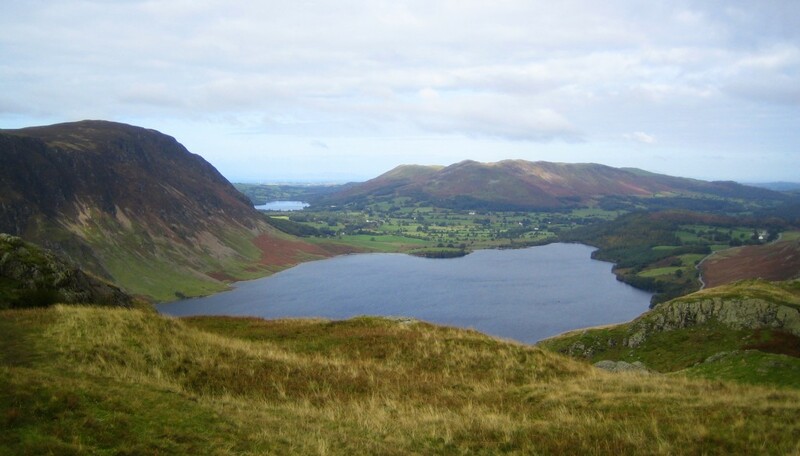 On the way there are great views back over Crummock Water and Loweswater out to the Solway estuary. Just as we were about to climb on to the ridge I heard Phil G1OPV/P calling from the summit of Mellbreak (the hill on the left in the above picture.) Though only a couple of miles away I could only just hear him due to the steep ground between us. I hurried to the top to make contact and agree to work again when I reached the summit of Rannerdale Knott for a true summit-to-summit. I had barely reached the summit and was still getting my breath back when I heard a "CQ WOTA" call and made contact with M0AYB/P (also Phil) who was on Dodd, another fairly low fell beside Bassenthwaite Lake. Anyone who knows the area was surprised that VHF signals could travel between two such low hills with a large mass of mountains in between. Olga captured me making the contact with Phil on her camera. I was using the Motorola GP300 on this occasion, with 4W out to a 5/8 wave telescopic "Black Whip" antenna. In my left hand you can see the Olympus personal voice recorder I use for logging. After signing with Phil I was immediately called by Geoff, G4WHA/P who had arrived on the Causey Pike, the summit I climbed a few weeks earlier and failed to recognize or activate! Whilst I sneaked up on it the back way making it easy to reach, Geoff tackled it by the direct route which he informed me had turned out to be tougher than he anticipated. Accompanying Geoff on his first Wainwright outing - a baptism of fire - was Mark M1MPB/P so I made two contacts with the same summit. Then I contacted Phil G1OPV/P again to make the summit to summit with Mellbreak. I suspect we could have made the contact by shouting if the wind had been in the right direction, in fact I think I could just see Phil silhouetted against the skyline on the summit. 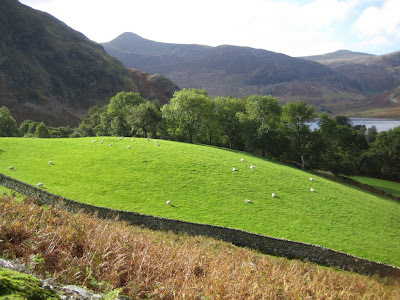 After that I was called by Robert M3XJV/P who was on Birkhouse Moor, on his way to Helvellyn. This was a nice addition to my chaser total as the Helvellyn hills seem to be out of range of my home station in Cockermouth. 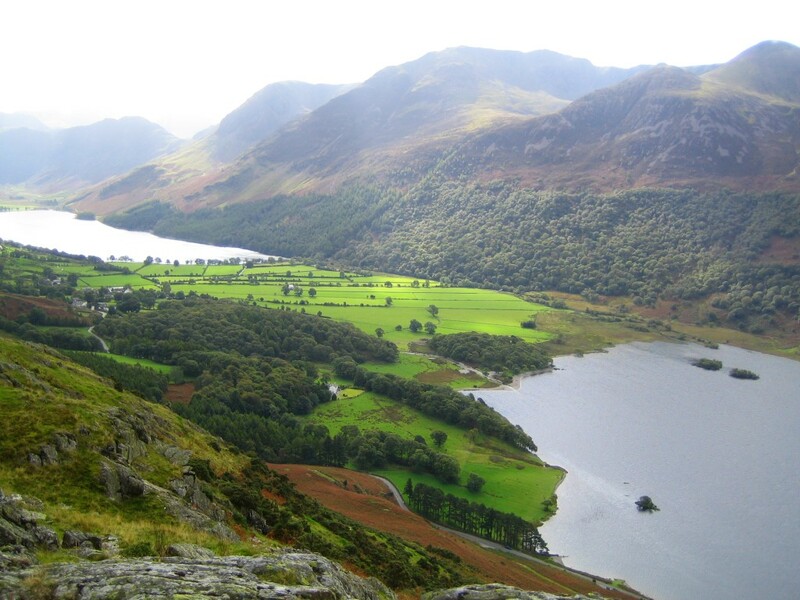 Finally I made two contacts with home based stations: Roger G0MWE in Dearham and Ron G0UQC in Keswick before I was able to sit down and join Olga having our picnic lunch and enjoying the view over Buttermere. We returned to the car via the precipitous direct descent down to the lake. It was a short walk but a successful one. Seven contacts including five summit to summits from a low fell that on previous visits (before WOTA) you would never expect to make a contact from. 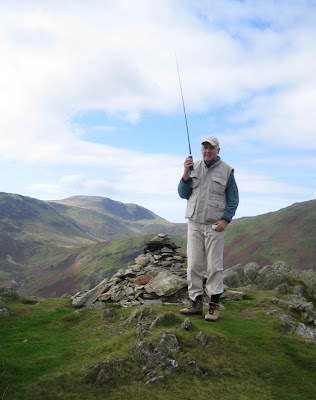 I think Wainwrights On The Air is transforming VHF activity in the Lake District and the comment from one activator that it is getting hard to find a clear frequency is proof of it. Beautiful scenery...makes me wish I were there again. The long antenna makes quite a difference and it's a joy to spend a day outdoors with the radio. It doesn't get much better than this.